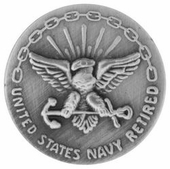 This 20 Years U.S. Navy Reitrement Pin is the official pin for U.S. Navy veterans that have retired from 20 years or more service in the U.S. Navy. The pin is silver in color, 5/8" in diameter, has the Navy Eagle in the center, a chain on top, and says United States Navy Retired across the bottom. Navy Veterans with more than 30 years of service receive a gold pin after retiring.